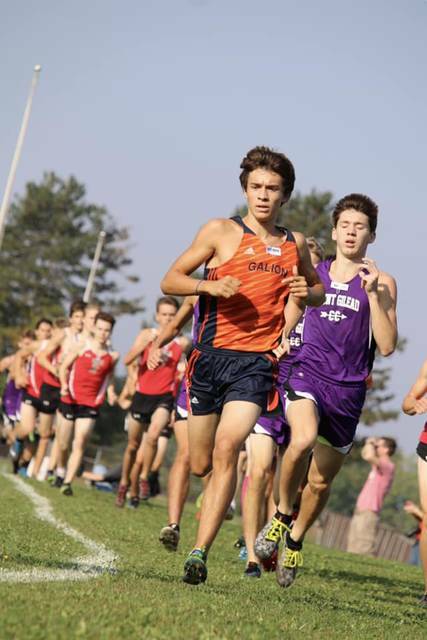 Photo courtesy of Noresa Nickels Galion’s Braxton Tate outlasted the other 68 boys in the field of the Mount Gilead Thill Invitational on Saturday to take home the individual title in a time of 16:29.16. MOUNT GILEAD — Galion’s Braxton Tate was the winner of the boys race last week in Mount Gilead’s cross country invitational, 16:29.16 Galion, however, would finish third overall as a team with 80 points. Fredericktown claimed the team championship over hosting Mount Gilead; 36-39. Cardington finished in fourth with 91 points while Cristo Rey finished fifth, notching 148 points. After Tate, Brenden Ganshorn turned in the best time for the Galion boys team, finishing his race in 19:14.97, good for 17th overall. Garrett Murphy finished in 19th in a time of 19:26.15 to round out the top-25 finishers for the blue and orange. Other runners in the field for the Tigers on Saturday were: 26. Braeden Horn; 30. Zach Slone; 32. Kurt Ensman; 35. Mikey Stover; 36. Simon Shawk and 43. Hunter Parsley. On the girls side of the invite, Allison Johnson of Mount Gilead won the individual championship in a time of 18:49.28. The Lady Indians would finish as the runner-ups behind Fredericktown; 30-33. The Galion Lady Tigers tallied 66 points for third place on Saturday. Galion had six girls finish within the top-25, led by a seventh-place finish by Brooklyn Gates in a time of 22:19.11. Zaynah Tate came in 12th with a time of 22:3943 while teammate Airyona Nickels snagged 14th in 23:07.88. Emily McDonald took 20th overall in 23:47.92. Sari Conner finished 22nd with a time of 23:58.51 and Ava Smith rounded out the top-25 in 25th place with a 5k time of 25:12.65. Harmony Lohr and Camile Nunez were also in the field on Saturday and earned 43rd and 49th, respectively. The Tigers are Marion on Saturday to compete in the Mid-Ohio Athletic Conference meet. MARION — In their final tune-up before their respective conference meets, the cross country teams from Northmor and Colonel Crawford were on the road to Marion on Saturday, October 6 to compete in the Harding Invitational. Team champion on the boys side was the squad from Ashland, outlasting second place Shelby; 41-45. Northmor clocked in at eighth overall while Crawford claimed 13th. Caleb Brown of Shelby won the boys race in 16:06.4. Northmor will head to Mount Gilead on Saturday for the Knox-Morrow Athletic Conference meet, while Crawford will be in Attica for the Northern-10 Athletic Conference meet. Over on the girls side, Makenna Heimlich of Shelby won in 19:17.0. Jonathan Alder won the team title with 91 points while Centerburg claimed the runner-up spot with 104 points. The Lady Golden Knights finished 13th and the Lady Eagles were 15th. The boys team from Northmor had three runners finish within the top-50 on the day, led by a 22nd place finish by Gavvin Keen in a time of 17:32.2. Ryan Bentley claimed 29th in a time of 17:45.0 and Mostyn Evans ran to a 44th place finish with a time of 18:21.3. Other Golden Knights in the field Saturday were: 80. Kooper Keen; 85. Amil Upchurch; 87. Austin Amens; 99. Chase Hoover; 125. BJ White; 128. TJ Diehl and 155. Alec Moore. For the Colonel Crawford Eagles, Mason McKibben was the only runner to crack the top-50, earning 38th overall with a finishing time of 18:05.2. Other runners representing the black and yellow of Crawford were: 76. Braxton James; 83. Alex Lawson; 108. Alex Mutchler; 127. Zach Leonhart; 163. Lucas Lawson; 168. Carson James and 183. Jacob Hoffman. The Lady Knights and the Lady Eagles had just one runner apiece finish in the top-50 on the day in Marion. Northmor’s Sabrina Kelley snagged 49th place with a time of 22:19.1 and Crawford’s Katie Hanft clocked in at 21:57.8, good for 37th. Other Northmor runners in the field were: 63. Kristie Wright; 69. Julia Kanagy; 71. Julianna DiTullio; 96. Olivia Goodson; 142. Carolyn McGaulley; 145. Bailey Snyder and 148. Maddison Yaussy. Also representing the Lady Eagles at the invite Saturday were: 56. Katie Hopkins; 115. Alison Manko; 122. Courtney Lyons; 123. Sheba Sulser; 146. Theresa Dzugan and 166. Abby Hocker. https://www.galioninquirer.com/wp-content/uploads/sites/38/2018/10/web1_Braxton-1.jpgPhoto courtesy of Noresa Nickels Galion’s Braxton Tate outlasted the other 68 boys in the field of the Mount Gilead Thill Invitational on Saturday to take home the individual title in a time of 16:29.16.